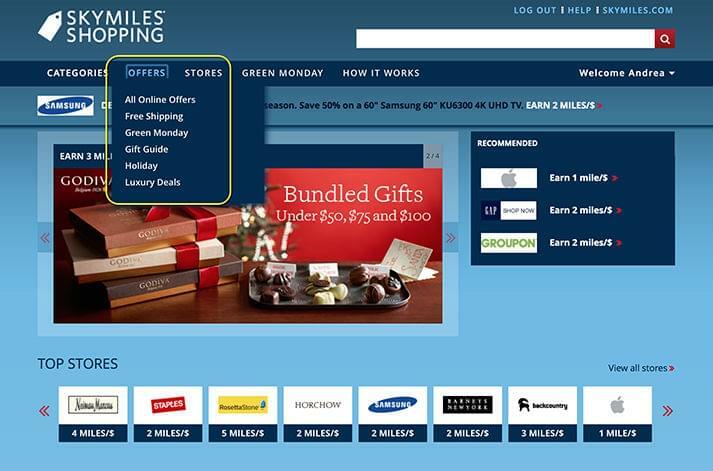 If you are a fan of online shopping and you’re a miles and points junkie, you have to get in the habit of using your favorite airline or hotel’s online shopping portal. 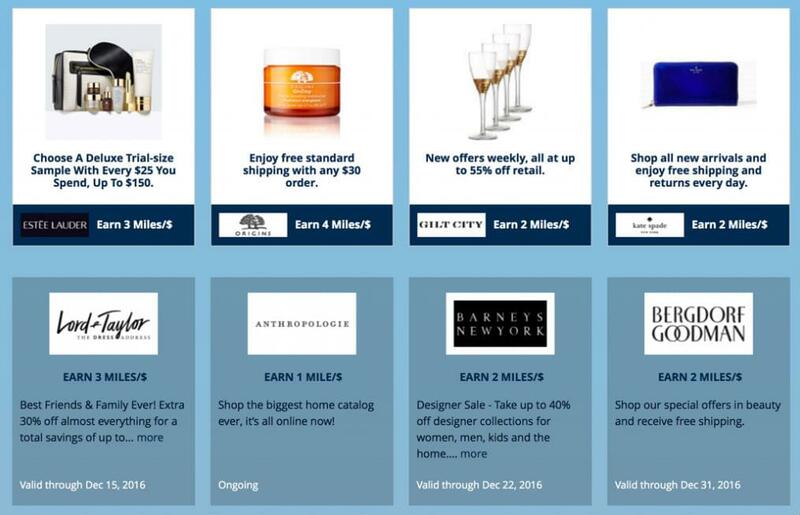 Delta Skymiles Shopping is just such a portal, and we’ll show you exactly how to sign up so you’ll be rewarded with extra miles on purchases made through this venue. We’ll also show you how to spot deals at SkyMiles Shopping and how to know when to pass up that purchase. What is the Delta SkyMiles Shopping Mall? All of the major airline frequent flyer and hotel loyalty programs maintain their own online shopping portals. These shopping centers feature a variety of retailers—like Staples, Macy’s, and Barnes & Noble—that you probably already shop with. 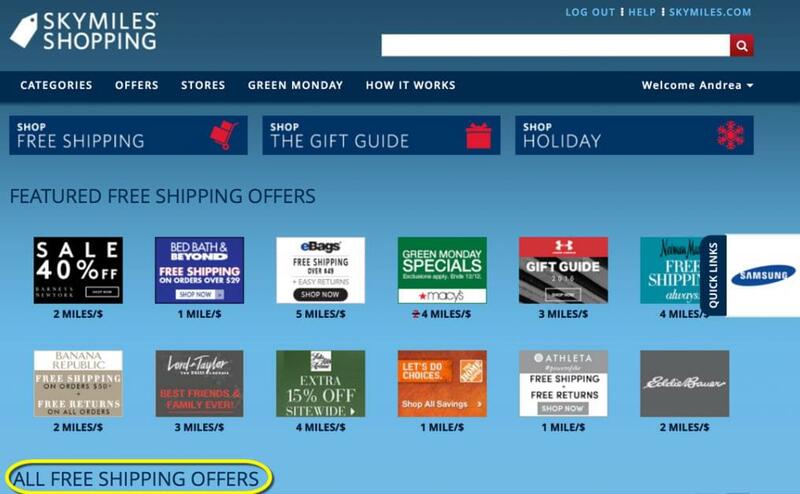 However, if you link to those retailers through the Delta SkyMiles Shopping portal, you’ll be rewarded with a certain number of SkyMiles for each dollar you spend. 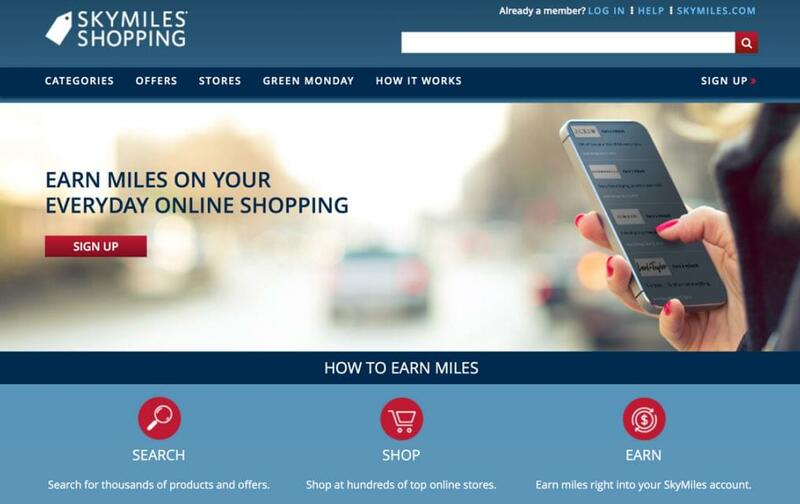 What Kind of Retailers are Part of SkyMiles Shopping? No matter what you need to purchase, from a baby stroller to a bottle of wine, you can likely find a merchant on SkyMiles Shopping that sells it. The mall is arranged by categories, including Apparel and Accessories; Babies, Kids & Toys; Department Stores; Office & School; and more. See the screenshot below for a full rundown of shopping categories. 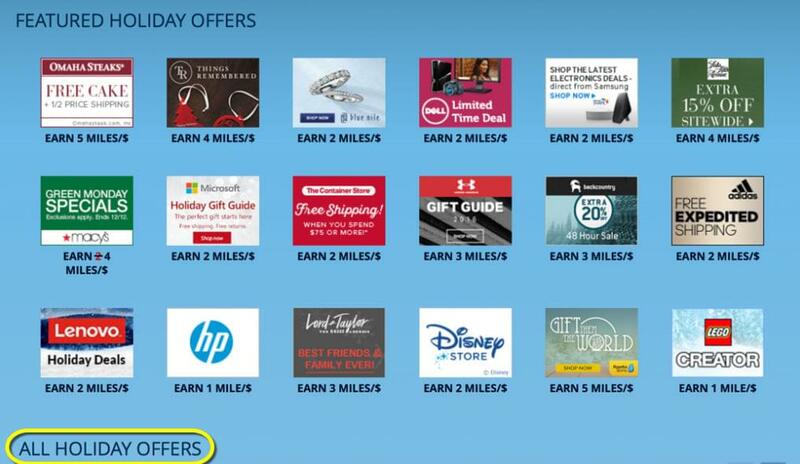 It’s very easy to earn extra SkyMiles (and sometimes even points from other programs) by using SkyMiles Shopping. Here’s what you have to do. 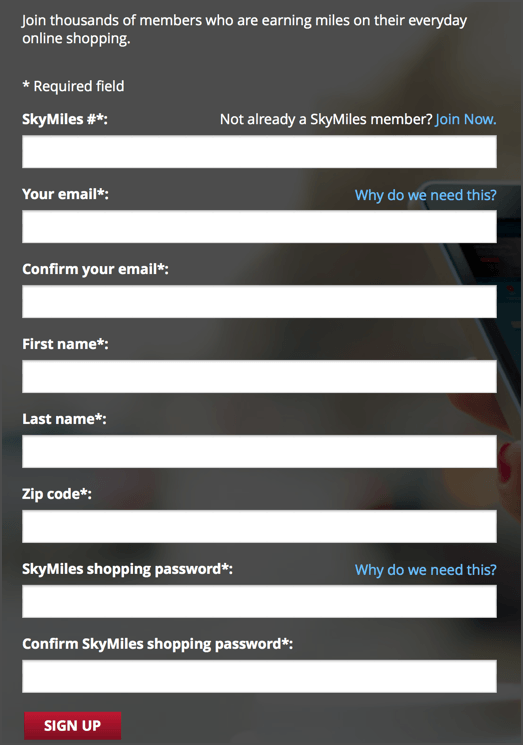 1) First, sign up to become a SkyMiles Shopping member. 2) Log in to the SkyMiles Shopping online shopping mall. 3) Search the store you want to make a purchase from. Let’s say you want to buy something at Lands’ End. Just start typing in the name of the store you’re looking for in the search box at the upper right corner of the page. Once you type a few letters, some options will automatically pop up. 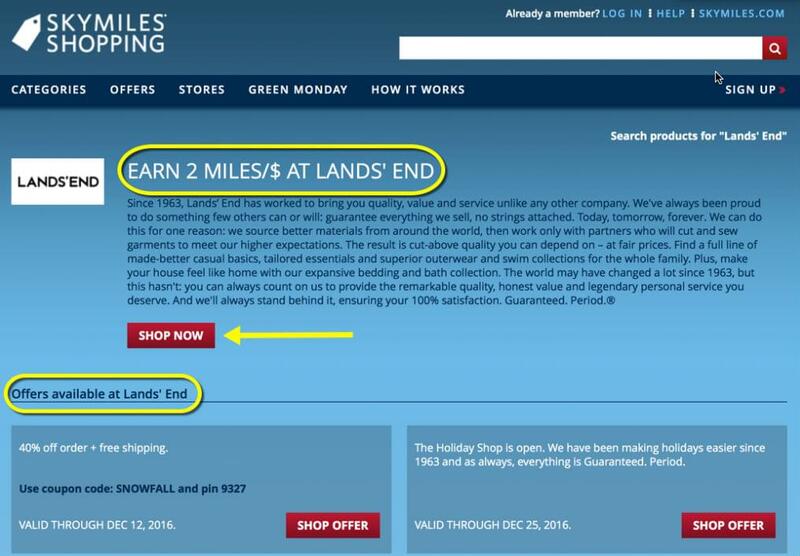 You can see in this example that Lands’ End is part of the SkyMiles Shopping mall and the payout is two miles per dollar spent. 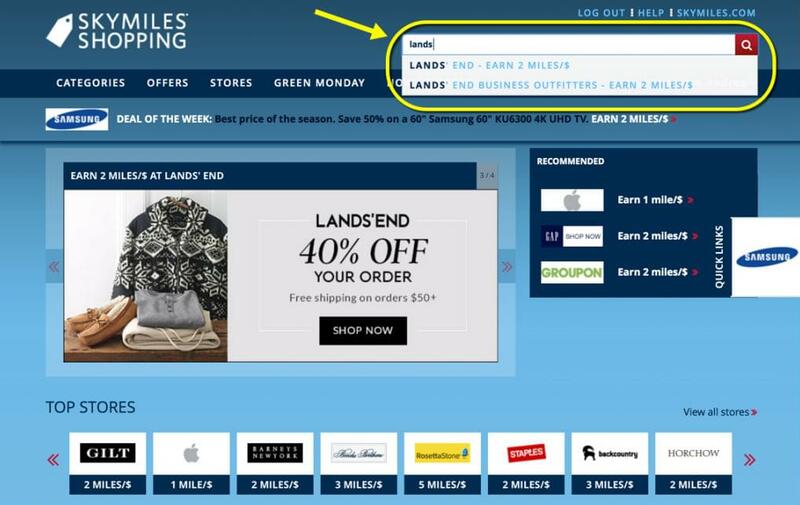 The same payout rate applies to purchases made at Lands’ End Business Outfitters. Click on the link where you want to shop. A page will appear that outlines how many miles per dollar you’ll earn for each purchase. And, if there are any special offers (discount coupons, free shipping, etc. ), you’ll find those deals listed at the bottom of the page. When you’re ready to go shopping with that retailer, click the Shop Now button. Then, just shop as you normally would. Add items to your cart and check out when you’re finished. Delta SkyMiles Shopping will keep track of your purchase and will send you an email—usually within five business days—confirming the miles earned for that particular purchase. It’s easy to find all kinds of deals and promotions at SkyMiles Shopping. Here’s what to look for. 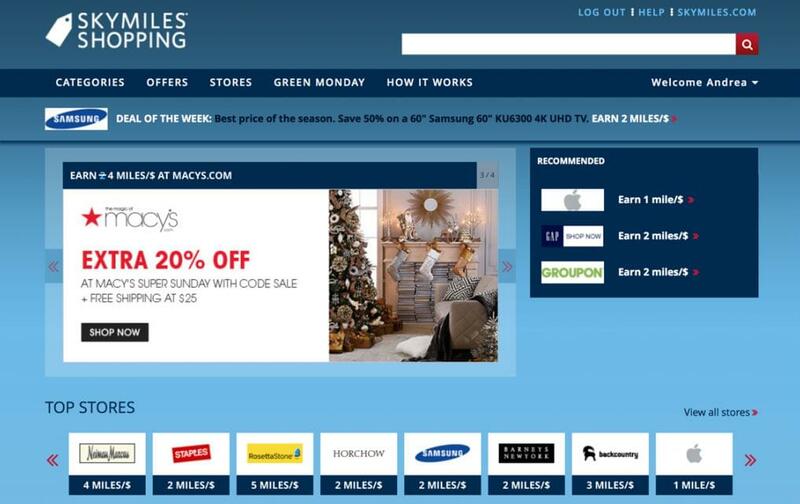 When you first surf SkyMilesShopping.com, look at the top third of the page. If there is a Deal of the Week, it will be listed here. See the Samsung example below. If the Deal of the Week isn’t of interest, there is a ton of other deals to dig through by clicking the Offers tab in the main horizontal navigation bar. You can then select from a few options, including a list of All Online Offers, Free Shipping, and Luxury Deals. Note that we’re writing this story during the winter holiday season so there are a few extra deal categories, including Green Monday (see below for the complete definition of Green Monday), Gift Guide, and Holiday. If you want a bird’s-eye view of all the current offers, click on Offers and then All Online Offers. You’ll see a few Featured Offers at the top of the page but scroll down to where it says All Offers. Here you can view the offers as a list and sort by store name, earn rate, the newest deals, or the deal’s expiration date. Sometimes you have a specific item you need to purchase from a particular retailer. You could make the purchase anywhere but you’re looking for somewhere that offers free shipping. When that’s the case, visit SkyMiles Shopping and click on Offers and then Free Shipping. 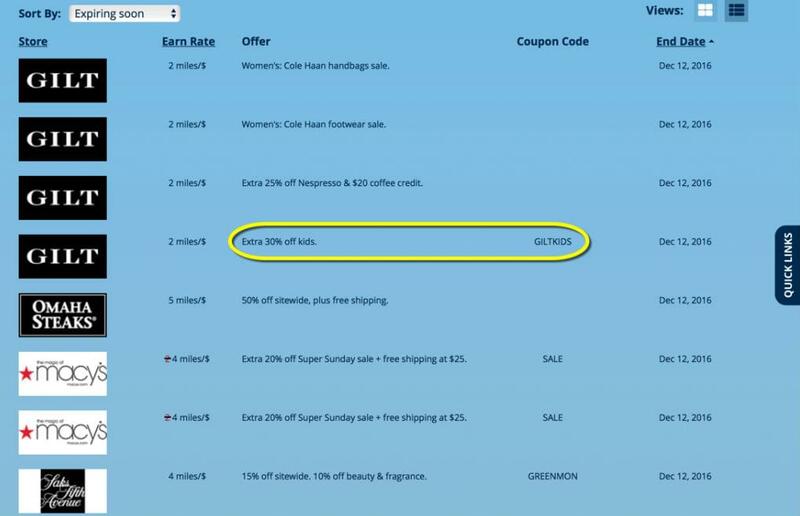 At a glance you can sort vendors offering free shipping on orders. Again, you can sort this information by store name, earn rate, the newest deals, or the deal’s expiration date. 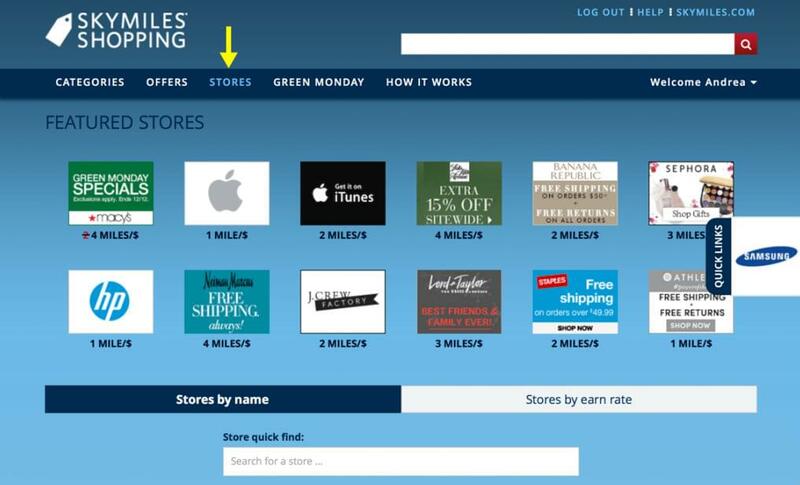 If you’re not a shopping enthusiast, you might not know what Green Monday is and you’ll see it referenced in some of the screenshots illustrating how to use SkyMiles Shopping. The term was coined by eBay and is used to describe the best shopping day in December. Green Monday is similar to Cyber Monday and it’s usually the second Monday in December. 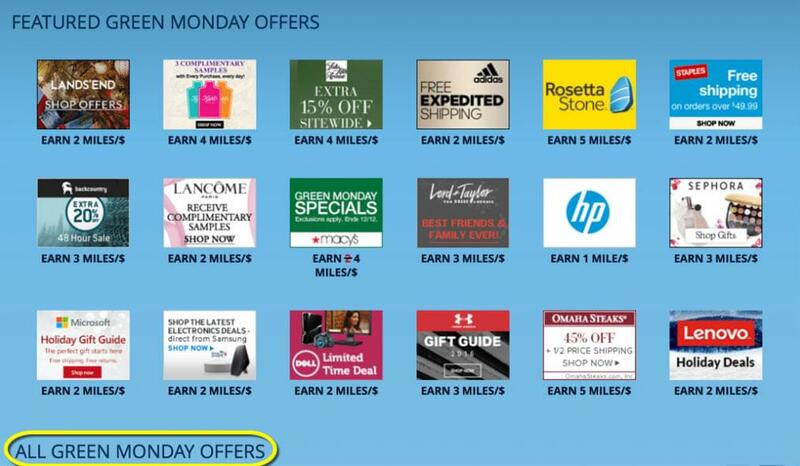 Delta’s SkyMiles Shopping mall offers specific deals for Green Monday. Even though Gift Guide is listed under the Offers tab, it’s not really a deals page. Instead, it’s an advertorial that presents gift ideas for men, women, and children. 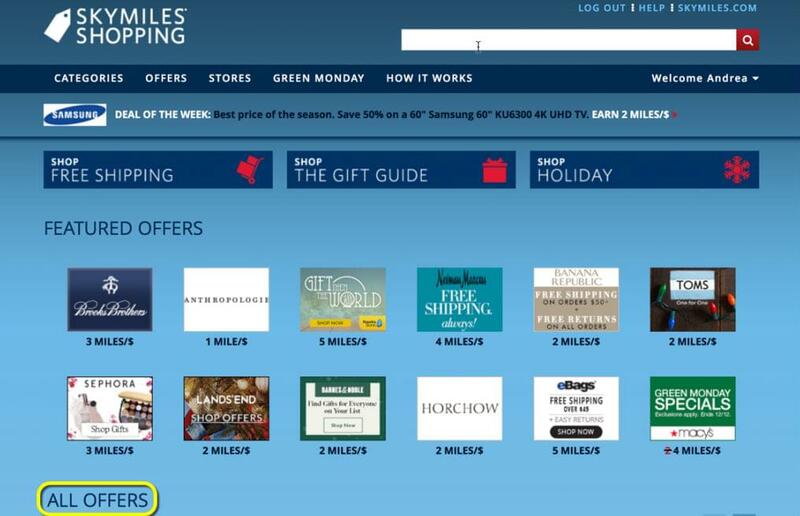 SkyMiles Shopping includes a Gift Guide during certain holiday seasons throughout the year. If you click on the Offers tab and then select Holiday, you’ll see a compendium of deals that are active throughout the holiday season. Some are limited-time promotions while others are the standard offer through the SkyMiles Shopping mall portal. The Holiday page is really just another method of promoting existing deals that can also be found through the above-mentioned methods. The Luxury Deals page is really just another way to view the earning ratios of various vendors that categorize themselves as luxury brands. If you want to know which stores offer the most miles per dollar spent or you just want to know the payout for one particular retailer, click on the Stores tab at the top of each page. 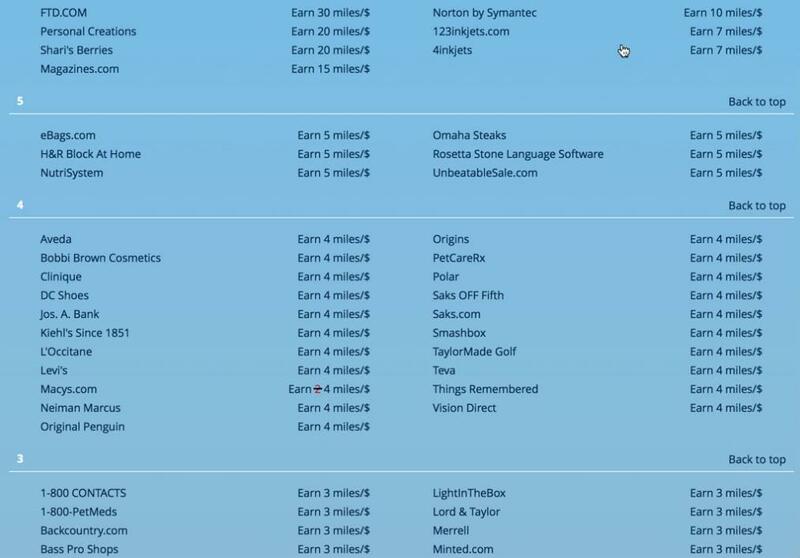 You’ll get to a page that shows some Featured Stores at the top of the page and then scroll down to see Stores by Name or Stores by Earn Rate. Click the Stores by Earn Rate tab in the middle right of the page. This will give you a list of stores in order of their payout rates. If you’re trying to decide if you should use Delta’s SkyMiles Shopping mall or another airline’s portal, compare the payout ratios for the stores in both online portals. Which Credit Card Should You Use at the SkyMiles Shopping? If your ultimate goal is to earn as many Delta SkyMiles as possible, you’ll want to make all of your retail purchases through the SkyMiles Shopping portal. You’ll be rewarded with a certain number of miles for every dollar you spend. You’ll also want to pay for the purchase using your Delta SkyMiles-branded American Express credit card. That way, you’ll also earn SkyMiles from American Express for every dollar you spend on that retail purchase. Let’s look at an example. You’ve wanted to buy a 13-inch Apple MacBook laptop for a while. You see a free shipping deal at SkyMiles Shopping and decide that now is the time to make the purchase. The current payout rate for all Apple purchases at the Delta SkyMiles Shopping mall is 1 mile per $1 spent. You pay $1,499 for the computer and SkyMiles Shopping rewards you with 1,499 SkyMiles. You pay for your purchase using your Gold Delta SkyMiles credit card and American Express also rewards you with 1,499 SkyMiles (one mile per dollar spent on the card). So, by linking to Apple via the SkyMiles Shopping portal, you earned a total of 2,998 SkyMiles. Like any shopping experience, you’ll need to parse all of the special discounts and deals offered to figure out what’s a good deal and what’s a bad one. With online portals like SkyMiles Shopping, you’ll often find a variety of special offers, including things like coupon codes and free shipping offers. One important thing to remember is that you often can’t use a coupon code from a third party when linking through to a retailer from a loyalty shopping portal. For example, if I get an email from the Gap with a coupon code, I probably can’t use that in conjunction with the SkyMiles Shopping mall. That would be double dipping and it’s not allowed on a lot of these portals. You’ll have to read the terms when you click through to each particular vendor. 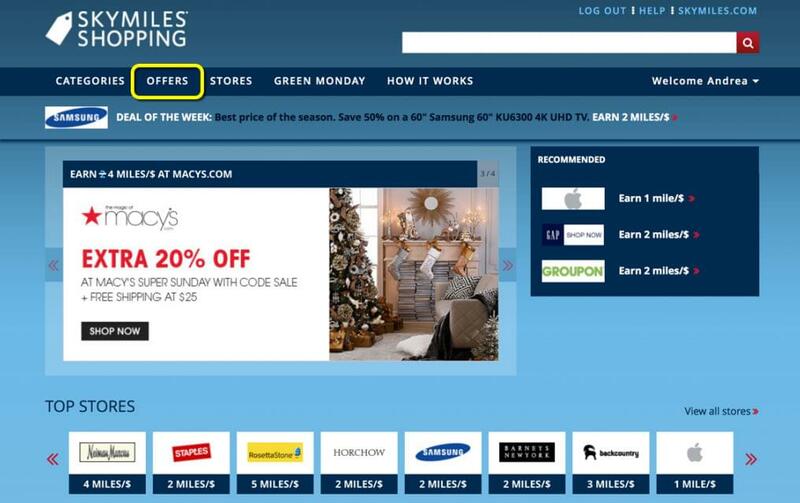 However, each portal—including SkyMiles Shopping—includes its own coupon codes for a variety of retailers. Just take a look at the list of stores that make up SkyMiles Shopping and you’ll see notations for special coupon deals like the one for 30 percent off kids merchandise at Gilt. Take some time to investigate all that SkyMiles Shopping has to offer and determine if you’ll make it your portal of choice for future online shopping sprees.